Gone are the days of wood picket fences, which were once the dream of many future homeowners and even referenced to in a variety of songs and films as part of the American dream. Today, there are numerous options for fences, which can make deciding on what type of fence you want to be a difficult decision. When it comes to building a new fence in Northern Virginia, your options include wood, iron, vinyl, bamboo, and chain link. Strength and Flexibility: Vinyl is nearly five times as strong as wood, making it much harder to bring down. In places that experience extreme weather conditions such as the strong winds and rain we experience in Northern Virginia during hurricane season or even during strong summer thunderstorms such as a derecho, sturdiness is a necessity. Wood fences may not remain standing during such a storm, while vinyl fences do. 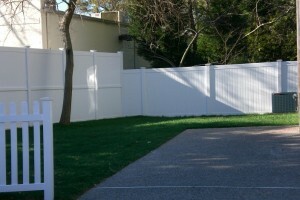 Vinyl fences are also very popular with waterfront homes, as they can tolerate large amounts of exposure to salt water. Maintenance: Vinyl fences tend to retain their color better than other fencing options, which mean your chances of needing to repaint the fence are significantly less than another option. To clean a vinyl fence, just grab a bucket of soap and water. Far easier than a whole weekend spent repainting a fence! Economical: Vinyl fences typically come with multi-year warranties, ensuring a long-lasting fence to meet your needs. They also are much cheaper than wood or iron fences, and require less maintenance, meaning you can put that money elsewhere. Sustainability: When vinyl fences are no longer useful, they can easily be recycled. For the more environmentally minded homes out there, vinyl fences are a popular option for that reason. Aesthetics: Because vinyl fences come in so many different colors, it is easier to match the fence to the color of your home and surroundings. Vinyl fences are the perfect fit for the homeowner who wants the function without the fuss. Give us a call today at 703-551-2609 or visit us online to find out why a vinyl fence might be the right fit for you and your home. This entry was posted on Wednesday, June 11th, 2014 at 3:21 pm. Both comments and pings are currently closed.